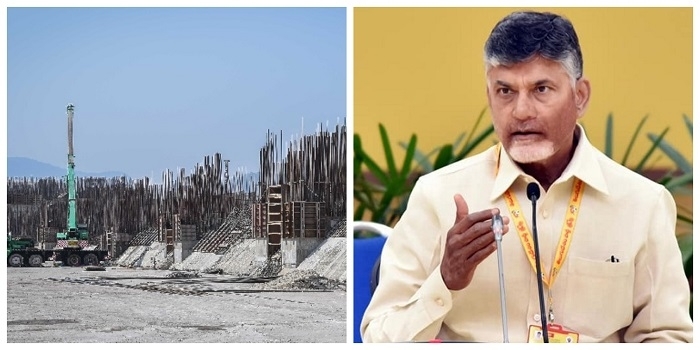 Amaravati, Jan 22: Amid strained relation between Telugu Desam Party and BJP, Andhra Pradesh Chief Minister Nara Chandra Babu Naidu on Monday urged Union Water Resource Minister Nitin Gadkari to address the fund crunch faced by the state government to complete multi-purpose Polavaram irrigation project. In an official letter, Naidu requested Gadkari to reimburse the amount of Rs.3,722.04 crores as per the revised Cost estimate. Informing about the ongoing construction work, Naidu claimed that 64.31% work has been completed by the state government with the expenditure of Rs.15,585.17 Cr. Expressing concern over the limited financial resources, the Chief Minister stated that the central government should provide sufficient funds so as to maintain the deadline of the mega project. Referring to the Revised Cost Estimate (RCE) Babu appealed the Union Minister to ensure the timely clearance from the central water Commission in a bid to avoid further delay in Land Acquisition and other works. He also mentioned that all the documentation required by the central body has been submitted by the AP government. On Monday, during his short visit to AP, Union Water Resource Minister Nitin Gadkari alleged that despite central assistance, the state government was not acknowledging the efforts of the Central government. The Minister also assured that BJP government under the leadership of Prime Minister Narendra Modi will provide every possible help to ensure the hassle-free roll-out of the prestigious national irrigation project.